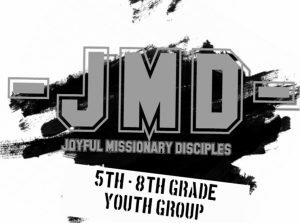 JMD (Joyful Missionary Disciples) Middle School Youth Group! Youth Group Meets on the following dates: Sunday, March 24 & Sunday April 7 beginning with Noon Mass, activities following in the Parish Center from 1-3pm. Meeting on Saturday, May 18 will begin at 1pm with parish member yard clean up, followed by celebration in the parish center from 3:00 – 4:30 pm. Let us empower our young people to live as disciples of Jesus Christ in our world today! Though St. Charles has not had an active youth group in quite some time, we have some amazing young people in our clustered parishes and I believe that we have the potential to have an amazing teen youth group that can serve the Lord, our community, and the Catholic Church. Ministry with adolescents helps young people learn what it means to follow Jesus Christ and to live as his disciples today, empowering them to serve others and to work toward a world built on the vision and values of the reign of God. Please consider this important ministry!!! I truly believe that it is time to bring back a vibrant and vital Teen Ministry to our parishes!